The Seahawks brought back LB K.J. Wright and D.J. Fluker, and added free agent LG Mike Iupati to replace J.R. Sweezy. Bring the splints and Advil. The Seahawks’ latest free-agent signings include a couple of relative old-schoolers who combined to play only 15 games last season. Brought back was LB K.J. Wright and brought in was LG Mike Iupati, both of whom had injuries sufficient to have their hires bear question marks. Also Thursday, the Seahawks re-signed a free agent priority, RG D.J. Fluker, to a two-year, $9 million deal, a big bump from the $1.5 million, one-year deal he had in his first Seahawks season. He too, has had injury problems, playing in 10 games with nine starts. Fluker just turned 28, so he’s not even football-old. But the three signings add players with established physical vulnerabilities. Then again, if the insistence is for big guys in perfect health, you are referred to the statue of David. Ten-year veteran Iupati, 32 in May, is a four-time Pro Bowl lineman who played 10 games last season with Arizona, then injured a knee (MCL). He hasn’t played a full season since 2012, when he was first-team All-Pro with the 49ers, who made him a first-round pick in 2010 out of the University of Idaho. He missed all but one game in 2017 with a torn triceps. He seems destined, if healthy, to replace LG J.R. Sweezy, who left in free agency for a two-year deal with Iupati’s old team, Arizona. At 6-5 and 331 pounds, Iupati has a great reputation as a plow, Pro Football Focus ranking him the past season as the No. 6 graded run blocker among guards who played more than 300 snaps. PFF says he has a top-10 run-blocking grade among guards in six of eight seasons, not including his injury-shortened 2017 season. Before his four years in Arizona, Iupati spent his first five seasons in San Francisco, where he worked under line coach Mike Solari, now with the Seahawks. Nor did it hurt his decision-making that his off-season home is in Boise. Wright, 30 in July, has been Bobby Wagner’s running mate for seven years in Seattle and is one of the locker room’s most well-regarded guys. But knee problems kept him to five games in 2018 and probably hurt his value in the marketplace. Wright’s signing was reported late Wednesday night as a two-year deal worth $15.5 million, with $7 million guaranteed. Iupati’s deal hasn’t been disclosed, but he played with the Cardinals for $5 million on a one-year deal. Iupati’s arrival and Fluker’s return would seem to resolve the 2019 set-up on the line, which helped the Seahawks lead the NFL in rushing with 2,590 yards, a remarkable one-season turnaround from the dismal results of 2018. But the group also allowed QB Russell Wilson be to sacked a career-high 51 times, eighth most in the league. So that might indicate where the run/pass choice will fall in 2019. Iupati will be left of C Justin Britt, and Fluker returns to the right side. The tackles remain Duane Brown and Germain Ifedi. Also returning is restricted free agent George Fant, who worked well in the jumbo package at tight end. Backups include Ethan Pocic, Jordan Simmons, Jordan Roos, Joey Hunt and Elijah Nkansah. Three days into free agency, the Seahawks seem to have checked the boxes on the O-line and linebackers, the latter supplemented by the re-signing of Mychal Kendricks, who was given a one-year, $4 million deal despite facing sentencing in April on his guilty plea to felony insider trading. But given the injury histories, the Seahawks are leaning ever more into the good graces of the football gods. What’s past is prologue…never a good thing to bank on players with injury histories, especially in an injury riddled sport. A player could easily lean toward protecting the contract rather than justifying it. Never is too strong. Carson looks pretty good, Earl was fine, etc. Every guy and every injury is its own case. I think Wright is a better risk than Iupati or Fluker, mostly because 350-pounders are always more susceptible to to pulls, strains and dessert buffets. Really nice moves, even with the potential injury issues. If my math is right, that’s 2 outside FAs signed (Myers and Iupati) and 5 inside FAs gone (Coleman, Sweezy, Thomas, Hundley, and Davis). My mind is more Emmenthaler-esque these days, but if nothing else changes, do the Hawks get 3 more picks in this year’s draft? If you mean compensatory, no. Any signings now create picks for 2020, and at the moment they have a third, fourth and two sixes. Time to draft Kaleb McGary and Trey Adams. Neither are guards, but I could see McGary as RT in 2020. 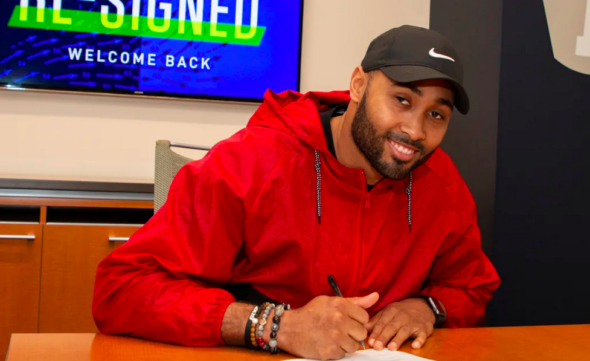 Steve Raible took a surprising shot at Earl on Twitter, saying other teams can sign another team’s problem child but that KJ is exactly the player the Hawks want when they say they want to take care of their own and that it will be an honor to call his name on Sundays. He was the ant-Earl last season, working out and training with the team and helping teammates while injured where Earl took off never to be heard from beyond social media. Thrilled to hear that DJ is returning also. His warrior mentality was the tonic the O-line needed. Wish JR (what is it with the initials?) and his broken foot was retuning. JR was also a warrior who achieved alternate Pro-Bowl status last season. But overall this has been a good offseason for the Hawks.